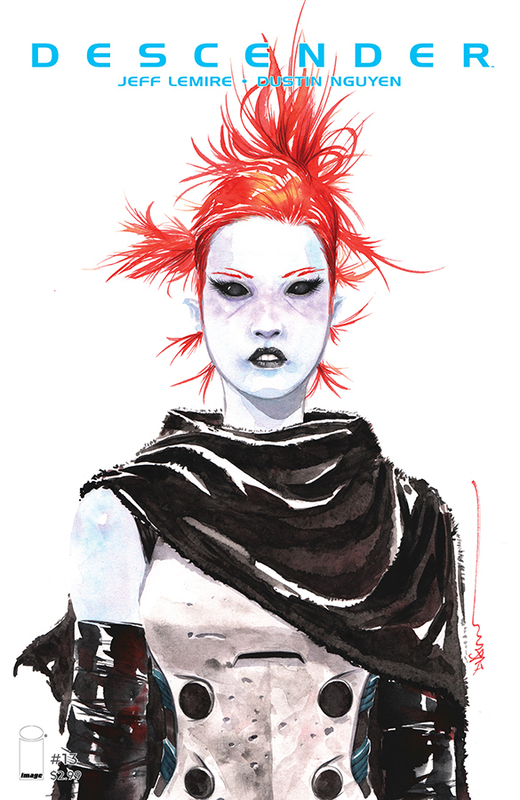 It pains me to say anything remotely negative about the normally excellent 'Descender' by Jeff Lemire and Dustin Nguyen but issue #13 is technically great but creatively unnecessary. In the last issue, we got the backstory of TIM-22. It was a little heart-breaking seeing what he went through, the abuse, the mistreatment, the neglect, and that helped inform his motivations now. It explained his sudden murderous turn. Lemire and Nguyen have a master plan I'm sure of it but for now, it feels like they're biding their time as they once again explore the backstory of another character eschewing the advancement of the plot. We already knew that Captain Telsa had a rocky relationship with her father, a superior of the UGC, and we discover its genesis. When the Harvesters attacked, her mother was caught in the carnage and her father became overly protective. He forbid her from joining the military academy, she went behind his back anyway and proved she belonged. He accepted it but she's carried a chip on her shoulder ever since. The story is well executed, drawn, and colored beautifully as usual but it's not particularly original. Telsa's testy relationship with her dad and her hard demeanor were already established. It all plays out in ways we've seen before and probably could have been explained in a single flashback. Using back-to-back to issues to delve into character developing stories seemed ill-timed. Instead of advancing the story, keeping us informed of Andy's whereabouts and the fight between the TIMS we get more backstory. And there's another backstory issue coming about another supporting character - Bandit. Quon sells out Telsa's identity, making her a bargaining chip in the process, but he may have saved her life. His claim to know where Dr. Solomon and the Ancient Robot are also seemed valuable enough information to his captors to buy them more time. I wished that would have been the meat of this issue but we'll have to wait for that to play out. That's the frustrating part. It's issue thirteen, we should be further ahead storywise. Lemire and Nguyen are fantastic comic creators who've been putting out fantastic volumes for years. Their talent isn't in question but as a fan, a comic book reader, a reviewer, I can't ignore the questionable decisions such talent sometimes make. We're treading water when we should be further upstream. 'Descender' is a great journey but it's time to hit the gas and stop idling.